Taste test: These chips were winners all around. They had lots of great jalapeño taste, a nice brittle crunch, an excellent kettle-cooked texture, a high level of crispness, pretty good heat, and a hot aftertaste. 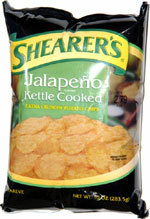 Not the hottest jalapeño chips on the market, but still hot enough to satisfy hot chip fans. Smell test: Very nice jalapeno smell. Made my mouth water, but not really hot.